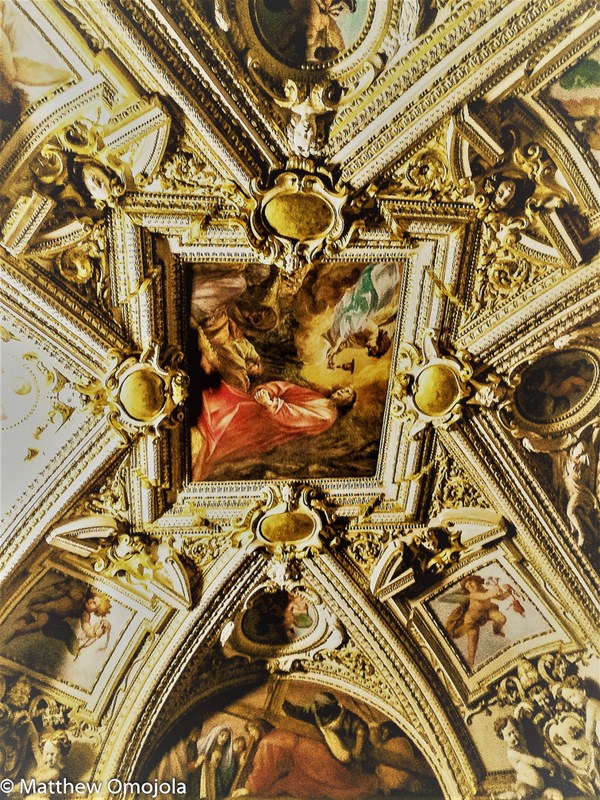 Looking up at the Vatican. Mesmerized! 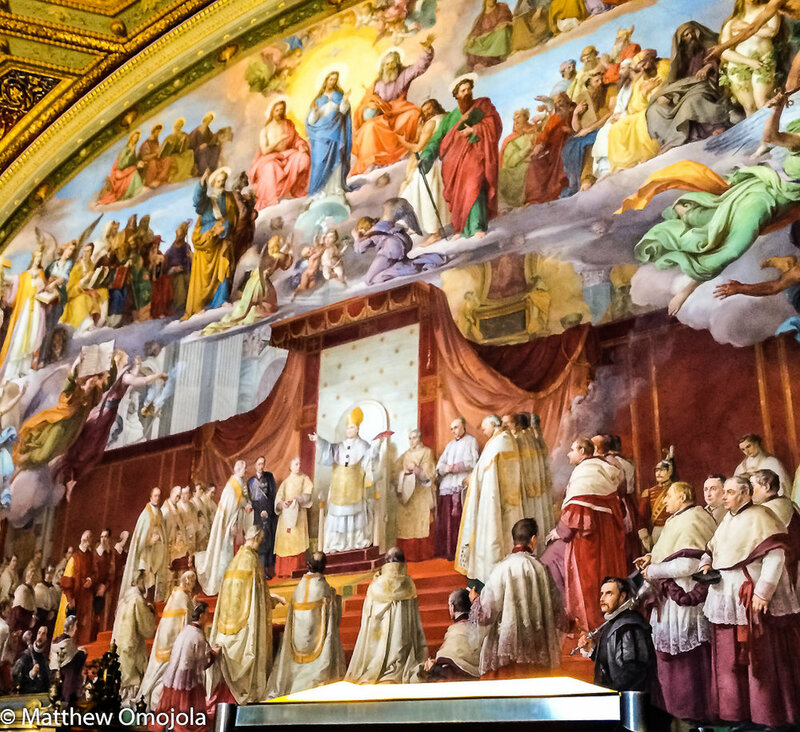 A visit to the Vatican could be one of the most rewarding trips for quite a lot of reasons. People probably do it for some personal reasons. The Vatican could mean different things to different people. 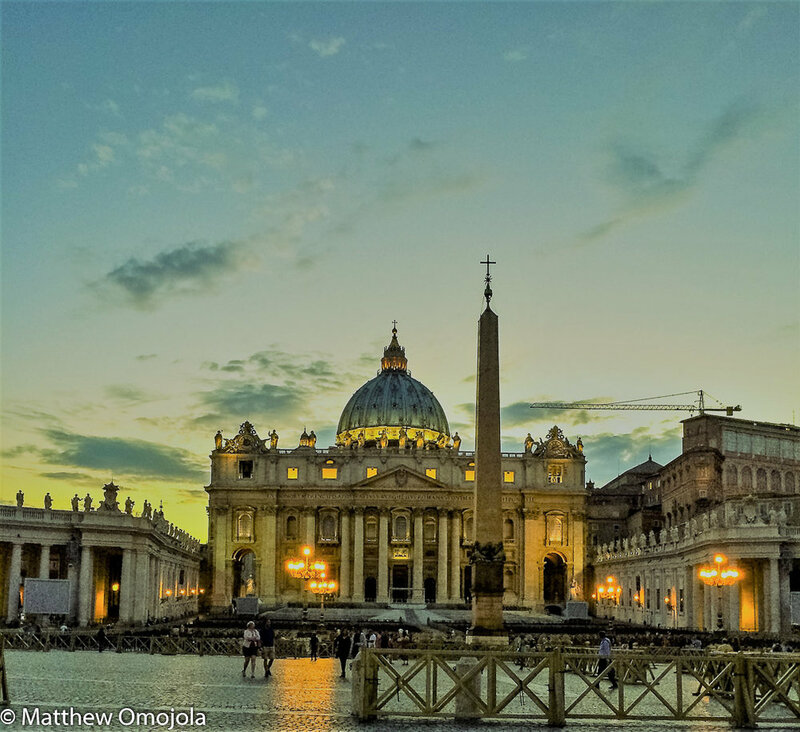 As the seat of the Roman Catholic Church, The Holy See, it is appealing to Catholics. It is also a City State, a state within a city, walled around and separated from the city of Rome. That has got to be fascinating! 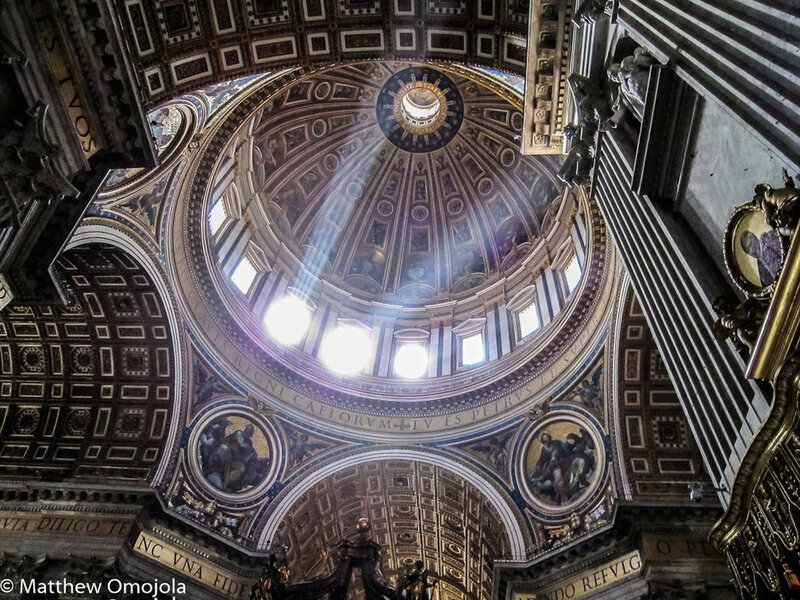 St Peter’s Basilica is the largest church in the world. It is worth visiting. 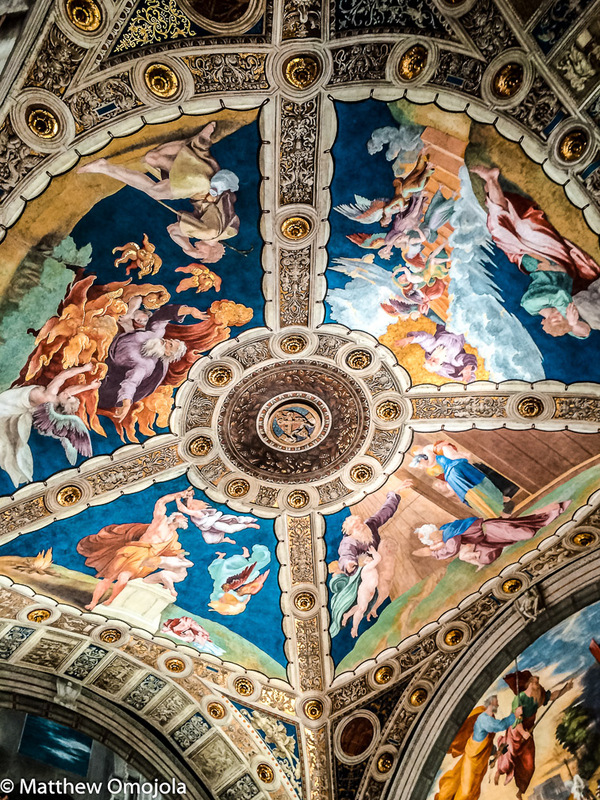 I ran into many non-Catholics at the Vatican suggesting that the appeal of the place goes beyond religion. The architecture is centuries old and awesome. It still looks pristine attesting to the power of ongoing maintenance of the structures. 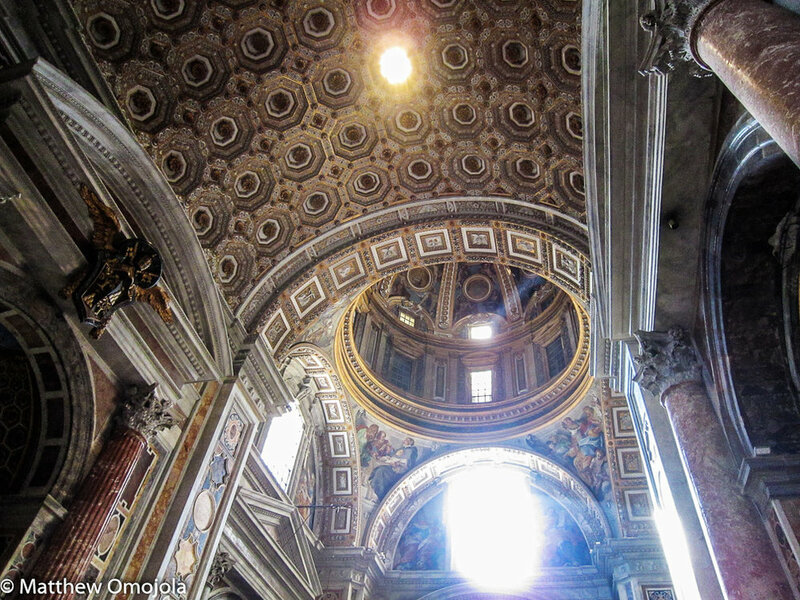 There are many people, saints and popes, buried in St. Peter’s and particularly in the mausoleums under St Peter’s Basilica. 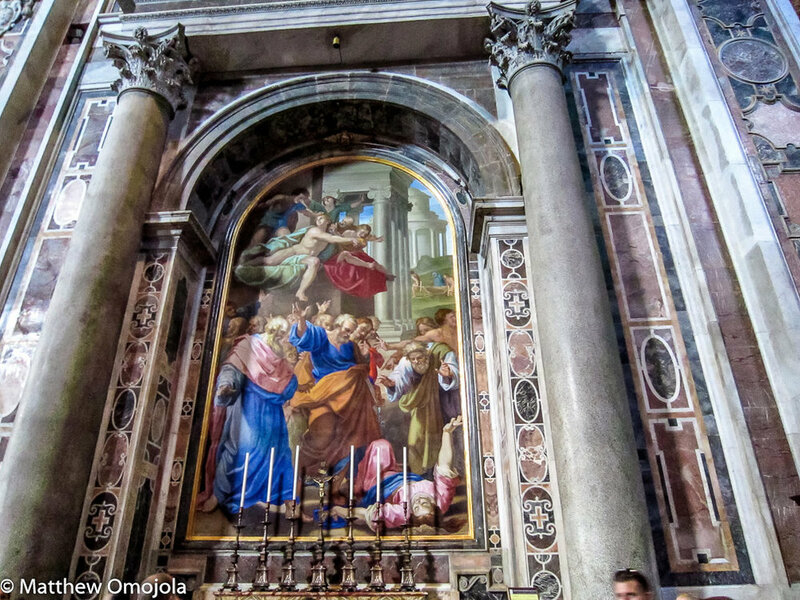 There are visible bodies of Popes on display in St. Peter’s Basilica. That gave me an eerie feeling! 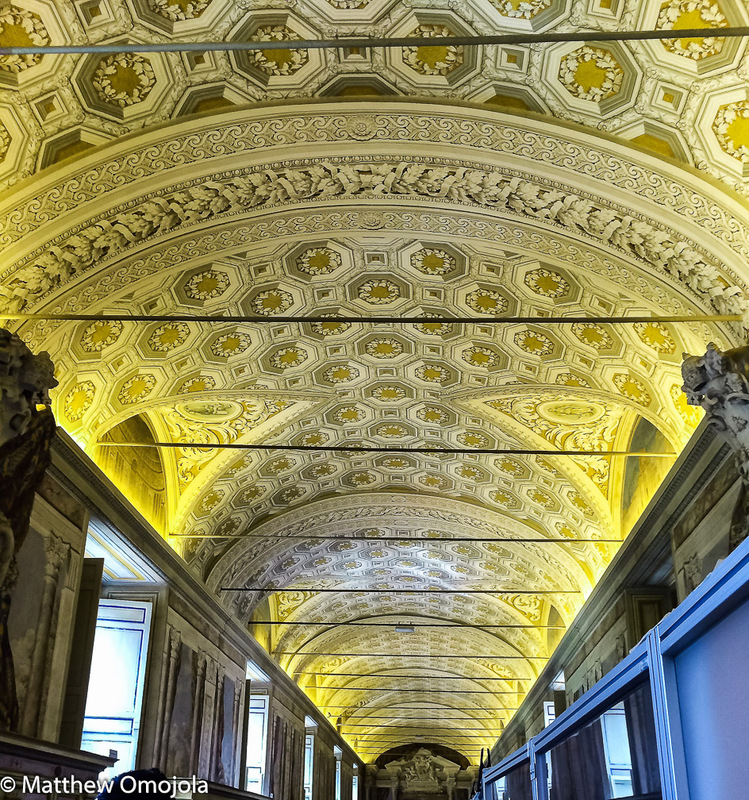 A visit to the Vatican could be educational: Lots of things to learn about the architecture, paintings, administration, crowd control, and the economy – the tourist economy! Understanding how this place has defied centuries of intrigues and wars is a great lesson in itself! 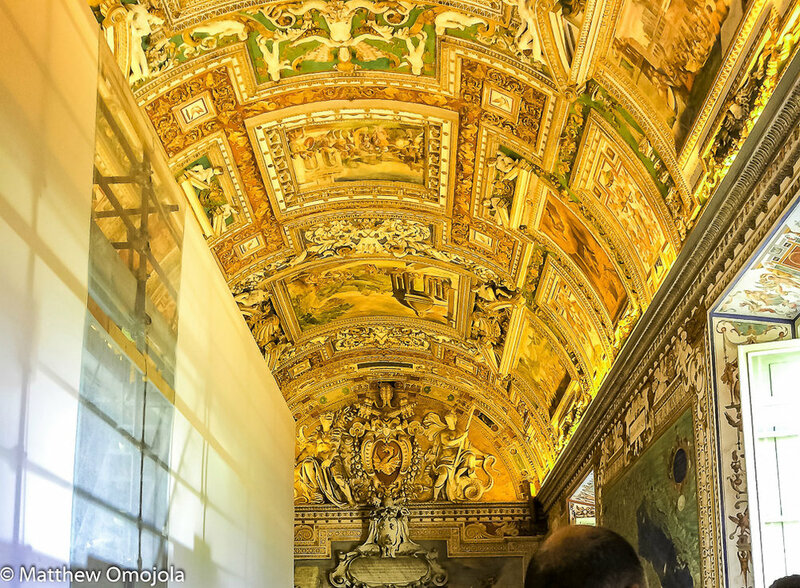 The Vatican Museum is unlike any other museum in the world. 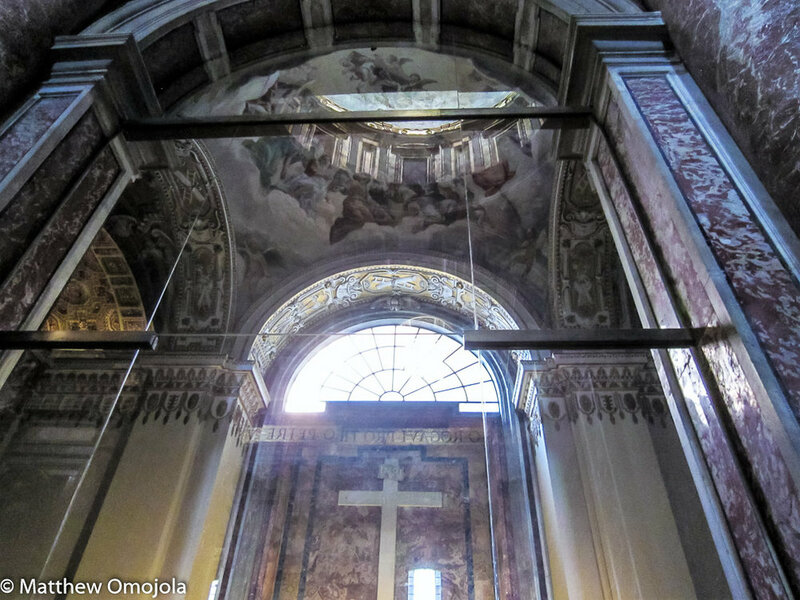 It contains both religious and secular artifacts, some dating back centuries. 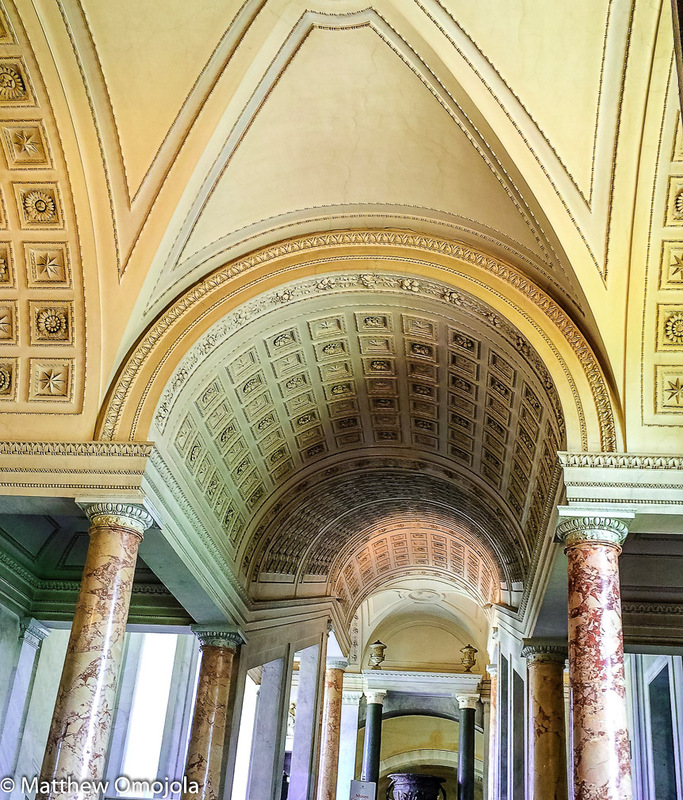 The ceilings, paintings, archeological displays, maps, sculptures, ornate doors, archways and the long corridors are breathtaking in their intricate designs and details. One wonders about the master craftsmanship that must have gone into making these happen. Some of these must have taken years to complete. 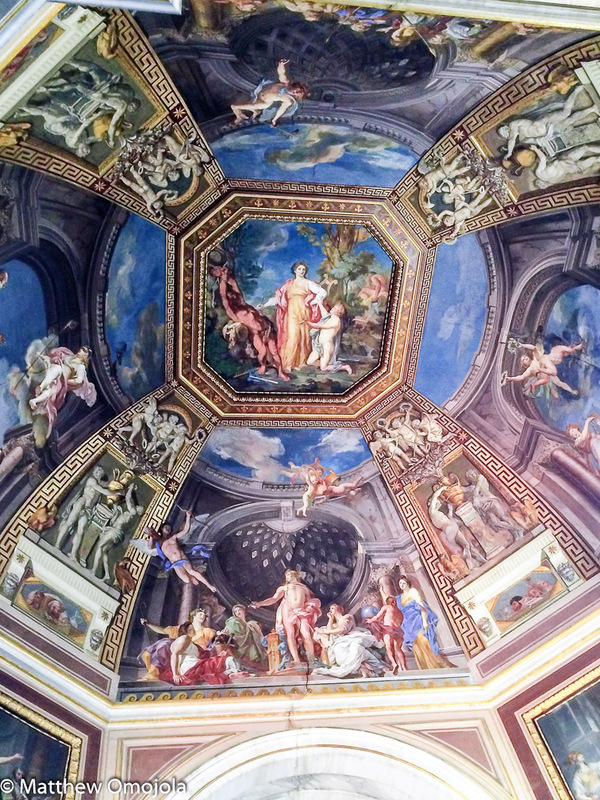 I was mesmerized and fascinated by the intricate designs of the ceilings, the archways, the doors and the paintings. 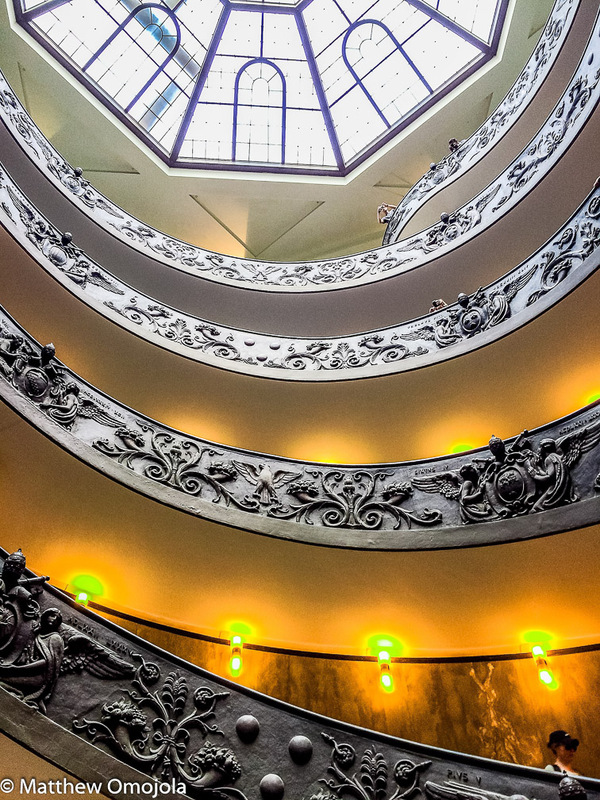 Looking up at the Vatican could provide lessons in biblical and church history, artisanship, master craftsmanship, endurance, perseverance, and above all, the role of planning and implementation in achieving a desired target or goal in life. It was not easy getting adequate photos. The moving crowd and the constant jostling, the lighting situation, sunlight streaming in through the roofs and windows casting reflections on the walls and ceilings make such a venture a challenge. If you have all the time in the world, it is doable. 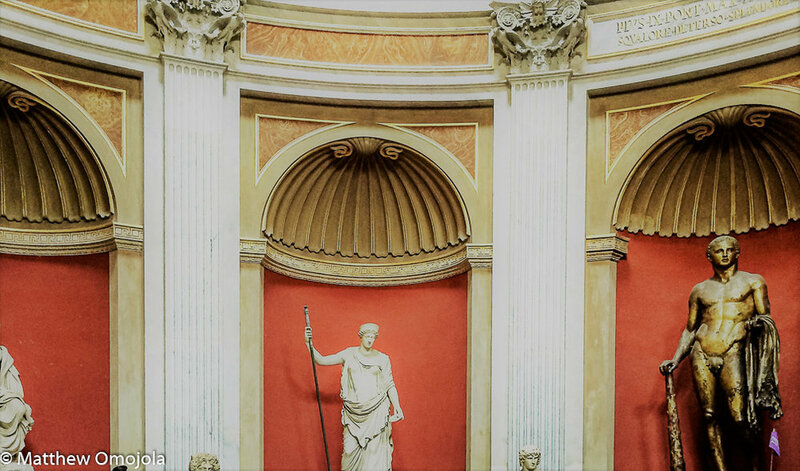 Here are some selected photos of ‘up’ at the Vatican. Admire them and see what you can learn from them!